Howard Dyer — What Happens in a BFC, Stays in a BFC! What Happens in a BFC, Stays in a BFC! The Block Formatting Context (BFC) in CSS is a concept that many developers can’t name or describe, but know all about. In this post I’ll briefly outline what a BFC is, the problems that they solve and how to create one. A BFC is a region implicitly (or sometimes explicitly) applied to an element, so that this parent element will contain all children elements, i.e. the parent element is the origin of the BFC, and interactions and behaviours of children elements alter as a side-effect of this. But seriously, what is a BFC? A good metaphor of a BFC is that it’s a protective parent that doesn’t allow any of its children to go outside of its 4 walls (if you were to think of the box-model, the 4 walls are the borders). Example 1: An outer element does not respect the height of a floated element contained within it. 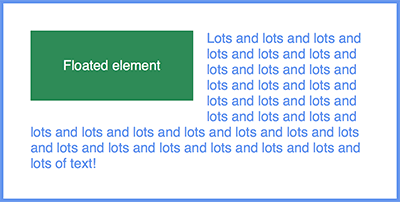 Example 1 shows a text element and a floated element inside an outer element without a fixed height. When there is not enough text to surpass the height of the floated element, the outer element doesn’t respect the height of the floated element in the same way that it respects the height of the text element. Due to this, the floated element ends up spilling out of the outer element. Example 2: An outer element that creates a BFC will respect the height of all floated element contained within it. In Example 2, a BFC has been applied to the outer element so that it now contains the floated element. 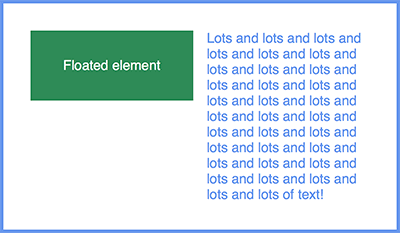 Example 3: Text that is placed next to a floated element will naturally wrap around it. Example 4: Text within a BFC will not wrap around floated elements that are outside the BFC. In Example 4, a BFC has been applied to the text element so that it no longer wraps around the floated element. Example 5: An element's margins will naturally collapse into another element's margins if placed adjacent. Example 5 shows a series of text elements (blue) within an outer element (grey). The outer element and all text elements have top and bottom margins. However we can see that the top margin of the first text element and the bottom margin of the last text element collapses with the margins of the outer element. Example 6: If an element is within a BFC, its margins will not collapse into margins outside of the BFC. In Example 6, with a BFC applied to the outer element, the margins of the first and last text elements no longer collapse. How do you create a BFC? A display property of table, table-row, table-row-group, table cell, table caption, table-header-group, table-footer-group or inline-table. You could also apply a display property of flow-root. Though browser support is still limited, the sole purpose of this property is to create a BFC. There are many issues that occur in CSS that, through iteration, you acquire knowledge on how to solve. But it’s quite interesting that, whilst problems are solved, it’s not always fully understood why the problems are caused or how the solution actually solves it. For Block Formatting Contexts it could simply be put, that what happens in a BFC stays in a BFC.